Pomegranates are a sweet fruit with a hint of tartness that originally grew in tropical Asia. Pomegranate molasses is a simple concoction of pomegranate juice, sugar and lemon juice. Therefore, you can get the same health benefits from pomegranate molasses as you can from pomegranate juice. Pomegranate juice contains antioxidants and B vitamins that provide various health benefits. Pomegranate molasses contains antioxidants, mainly vitamin C, that are beneficial to your immune system. When you digest food, a process called oxidation takes place wherein molecules called free radicals are formed. Free radicals are substances that can lead to tissue damage and may cause diseases such as heart disease or cancer. You can also absorb free radicals from environmental pollutants such as smoke and radiation. Antioxidants help your immune system protect cells against the harmful effects of free radicals. According to Thomas Behrenbeck, M.D., from the Mayo Clinic, pomegranate juice may prevent or slow the accumulation of cholesterol in your arteries. Cholesterol buildup causes your arteries to harden and narrow, and is the leading cause of heart disease. Antioxidants such as polyphenols can can reduce low-density lipoproteins that lead to cholesterol buildup. 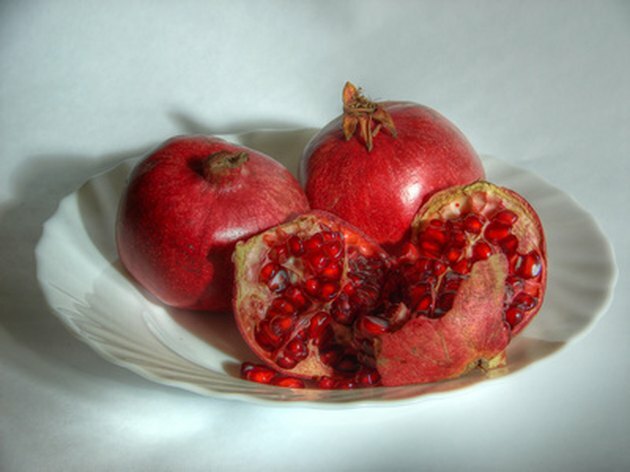 Pomegranates contain a higher amount of polyphenol antioxidants than most fruits. Pomegranate molasses contains several B vitamins including B1, B3, B5 and B6. Vitamin B1, or thiamin helps your body produce energy and is an aid to enzymes that help your muscles, cardiovascular system and nervous system. Vitamin B3, or niacin, helps to maintain the health and vitality of your skin, nervous system and digestive system. Vitamin B5, or pantothenic acid, helps promote normal growth and development, especially in young people. Vitamin B6, or pyridoxine, helps your body break down proteins you consume and maintains the health of your red blood cells that carry oxygen throughout your body. Mayo Clinic: Can Drinking Pomegranate Juice Help Lower My Cholesterol?